We have a nice selection of high quality Sword Belts. These Sword Belts are designed to let you carry your sword with ease. 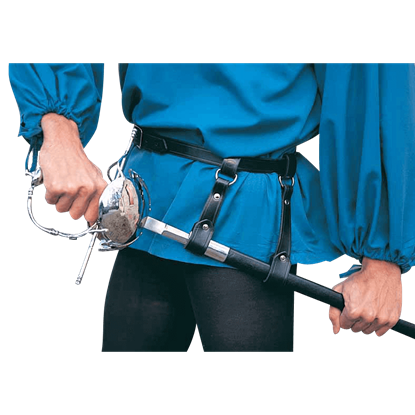 Most belts allow you to hang your sword on your left or right side, or on your back. All sword belts are heavy duty and have adjustable frogs to hold almost any size scabbard. All our sword belts are handcraft and made with quality leather. 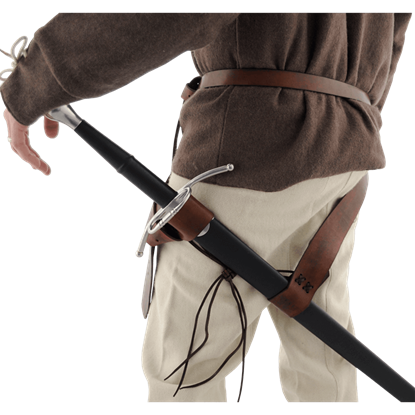 Our most popular leather sword belt is the double wrapped sword belt which can be worn on either side. 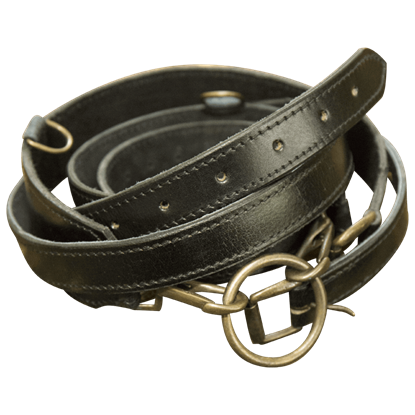 This extra long period belt is made of thick top grain black leather. The Medieval Sword Belt has a fully adjustable built-in frog that allows a wide variety of LARP weapons to be carried, so you never have to be unarmed. 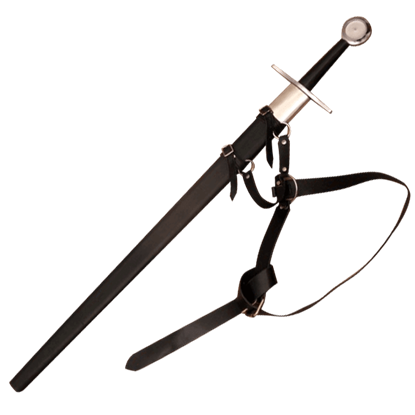 The straps on this rapier carrier can be moved along the belt for you to angle sword to suit you best, and the sword frog is also adjustable, allowing you to easily accommodate any rapier you might prefer to carry. 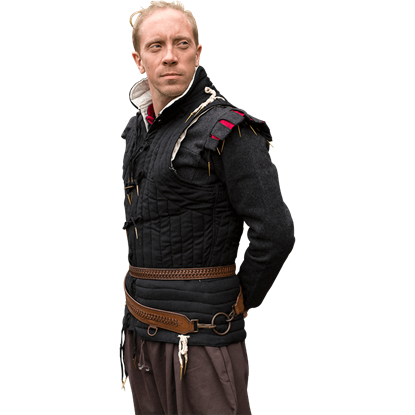 If you wish to enhance the aesthetics of your medieval or fantasy LARP outfit, a distinctive stitched pattern on your leather sword belt will do the job. 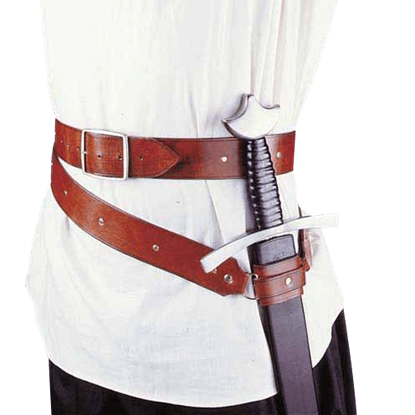 The Laced Leather LARP Sword Belt is the perfect accessory to add such a flair! The sword frog or dagger frog is a must-have for the warrior who plans on going into combat. But what about the warrior who wants both? 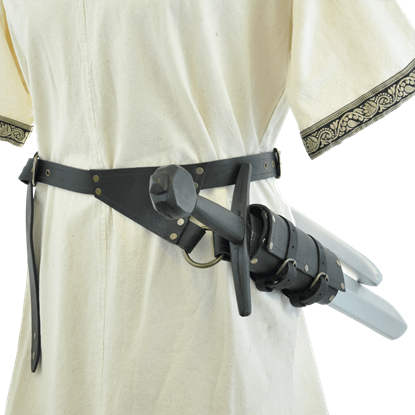 This LARP Sword and Dagger Belt is the way to keep your favorite blades close at hand! As an adventurer, you are accustomed to wandering the countryside, your only possessions being what you can carry comfortably on your back and belt. 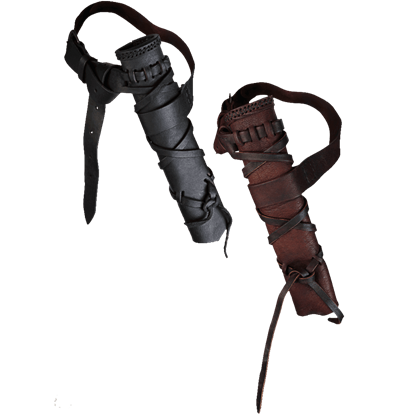 Rest assured, the Leather Sword Belt is sturdy enough to carry a several full bags. 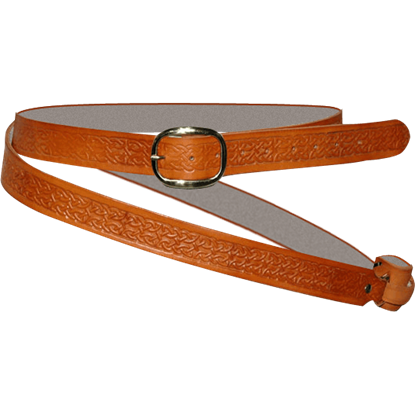 The beautifully crafted Louis Sword Belt is made out of high-quality natural leather, sewn by hand, and is secured with a wrought iron belt buckle. The end of the attached sheath is open, great for holding your favorite LARP sword. When the extra length of belt wraps around a body the second time, both hips then support the weight of the sword. 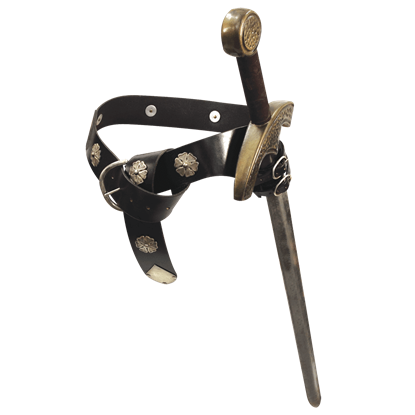 Besides the balanced suspension, this Medieval Double Wrap Belt presents a swashbuckling appearance. A good sword should always be kept at your side, and this Medieval Sword Belt accomplishes this task! This addition to your attire will keep your sword at your side, to complete your look and ensure that your blade is never out of reach.